The Firm is pleased to announce that Charles Reeves and Vincent Wagner have been recognized as named partners of the firm, which has changed its name to Woodard, Emhardt, Henry, Reeves & Wagner, LLP. Woodard Emhardt also congratulates Matthew Gardlik, Ph.D., Joshua Astin and Blake Hartz who have been elected to the firm’s partnership and is pleased to share that John McNett will continue with the firm as Senior Counsel. The firm name change recognizes Mr. Reeves’ and Mr. Wagner’s significant contributions to the firm and outstanding service and results they have achieved for our clients over the years. Their leadership will help ensure the continued success of the firm which celebrates its 140thAnniversary this year. Mr. Reeves joined the firm in 1976 and has represented a broad range of clients from individuals and start-up businesses to national and international corporations. His experience includes litigation, domestic and international prosecution, strategic planning and managing IP portfolios, and evaluating validity, coverage and right-to-use issues in connection with opinion, transactional and other business-related work. Mr. Wagner joined the firm in 1978 and has represented clients in a wide range of matters, including patent, trademark, copyright, and trade secret litigation, patent interference and trademark oppositions, foreign and domestic patent and trademark prosecution, counseling and opinions, mediations and settlement negotiations, and licensing. Dr. Gardlik is extensively involved in all aspects of patent prosecution and litigation. He has successfully prepared and prosecuted inventions in a wide variety of technologies including chemical, pharmaceutical, medical device, and diagnostic technologies. His litigation experience includes the successful defense of a retaliatory trade secret misappropriation claim and he continues to represent the plaintiff in the earlier-filed patent infringement suit including in the successful defense of thirteen associated Inter Partes Review proceedings at the USPTO. Mr. Astin specializes in U.S. and foreign patent preparation and prosecution for a variety of technologies including: tissue engineering, stem cells, implantable medical devices, and genetic sequence listings. His patent experience includes patentability analysis, freedom to operate analysis, as well as licensing and agreement work. Mr. Hartz focuses his practice on intellectual property litigation in both federal court and administrative proceedings at the USPTO, having represented clients in patent, trademark, and trade secret cases in courts across the country, various trademark opposition/cancellation actions, and more than a dozen patent Inter Partes Review proceedings. He has worked on all stages of disputes, from pre-filing investigations through appeal, and also maintains active patent and trademark prosecution dockets, including serving as U.S. counsel for overseas companies and attorneys. The firm congratulates our new named partners and our newest partners and looks forward to building on Woodard Emhardt’s 140 years of protecting and defending client’s creative and intellectual assets. In a multi-district case involving 26 defendants, Judge Miller of the U.S. District Court for the Southern District of Indiana, granted the defendants’ motion for an order declaring the case exceptional and awarded attorneys’ fees. The original suit alleged that the defendants infringed plaintiff’s family of patents relating to ethanol production processes. The ensuing litigation culminated in the Court finding that the patents were invalid and not infringed by any defendant. Those findings were further bolstered at a trial in which the Court then found the patents unenforceable due to inequitable conduct by the attorneys. In consideration of the Court’s previous holdings, Judge Miller reasoned that the defendants had shown that this case was exceptional and appropriate for fees. Woodard Emhardt attorneys Spiro Bereveskos , Dan Lueders, and Lisa Hiday represent Defendant Iroquois Bio-Energy Company, LLC. The exemplary chair could have aspects that fit into any of the intellectual property categories. It could also be protectable by none of them, and only strong competitive effort will make and keep it successful in the marketplace. Exploring all avenues gives the client the best opportunity for protection suitable to his or her needs and goals. 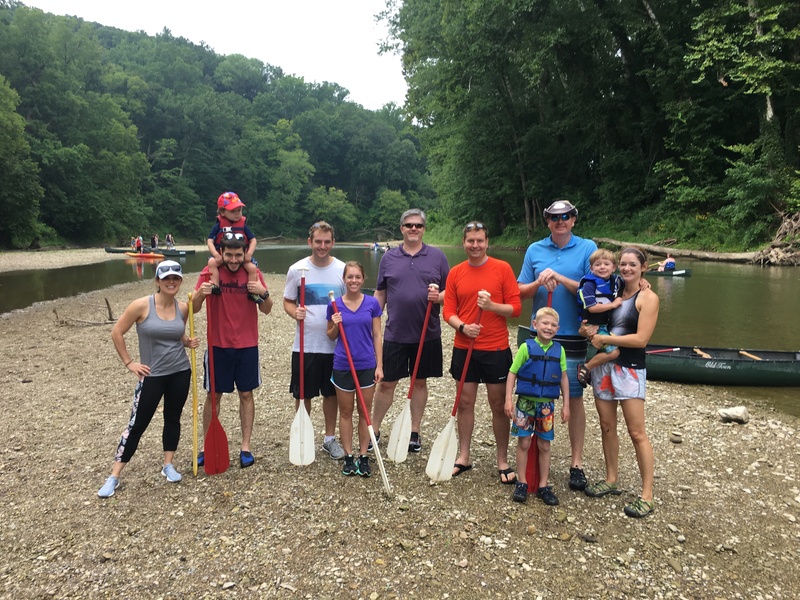 Woodard Emhardt attorneys enjoy canoeing with family on Sugar Creek in Montgomery County. Weather cooperated by providing enough water in advance to move the canoes along the creek. Perfect conditions for the day were dry and a bit overcast and a great time was had by all. A picnic lunch rounded out the excursion. Beginning in November 2018, Woodard, Emhardt, Moriarty, McNett & Henry (WEMMH) client FlightAware, along with Aireon, will utilize their revolutionary GlobalBeacon product to test real-time tracking of global aircraft. Airlines and aircraft operators will be expected to track their fleet globally at a frequency of one position every 15 minutes during normal operations. By 2021, they will be required to automatically receive positions once every minute for aircraft in distress. GlobalBeacon provides the most simple and cost-effective solution for the International Civil Aviation Organization (ICAO) Global Aeronautical Distress Safety System (GADSS). By combining FlightAware’s data processing platform and web-interface with Aireon’s space-based ADS-B network, GlobalBeacon transcends borders and Flight Information Regions (FIRS) and provides 100% global coverage, including over deserts, polar airspace and oceanic regions. Therefore, airlines and aircraft operators are able to exceed GADSS standards and recommended practices for flight tracking. Aircraft equipped with ADS-B Out transponders are tracked automatically with their position broadcast in real-time. Since ADS-B Out 1090MHz is mandated throughout the world, most aircraft do not require additional equipment to take advantage of GlobalBeacon. FlightAware is the world’s largest flight tracking data company and provides over 10,000 aircraft operators and service companies, as well as over 12,000,000 passengers with global flight tracking solutions. FlightAware leverages data from air traffic control systems in over 55 countries, from its network of ADS-B ground stations in over 175 countries, from Aireon space-based global ADS-B, and using global datalink (satellite/VHF) via every major provider, including ARINC, SITA, Satcom Direct, Garmin, Honeywell GDC, and UVdatalink. The FlightAware HyperFeed™ engine’s seamless integration of thousands of real-time, worldwide data sources combined with its powerful, intuitive, responsive and reliable web-based interfaces and data feeds yield the most capable and useful flight tracking application and service. FlightAware is the first company to offer free flight tracking services for both private and commercial air traffic and quickly rose to become the most popular flight tracking service. WEMMH patent attorneys John McNett (a licensed pilot) and Bill McKenna worked with three tech-savvy pilots, led by Daniel Baker to obtain 12 U.S. patents, addressing numerous features of their rapidly growing business when FlightAware was created in 2005. WEMMH has also secured trademark registrations in over 50 jurisdictions throughout the world to protect the FlightAware brand. See their website at www.flightaware.com or download their app on your smartphone. Partners Dan Lueders and Chuck Schmal were officially announced as members of the Global IP Star rankings in the May edition of Managing Intellectual Property IP Stars 2018/19. IP Stars is the leading specialist guide to IP firms and practitioners worldwide. Managing IP has been researching and ranking firms since 1996. This research has expanded over the years, with more than 80 jurisdictions now covered, making it the most comprehensive and authoritative analysis of the industry. The guide is viewed each month by over 25,900 users from 142 jurisdictions online, and the print versions are sent to over 10,000 IP Practitioners globally each year. During a recent trip to Slovakia, organized in part by Woodard Emhardt Of-Counsel Steve Zlatos, Governor Eric Holcomb signed a memorandum of understanding with the minister of economy from Slovakia. The trip was arranged with the aim to build on established relationships between Indiana and Slovakia. The focus of the gathering was to identify and enhance collaborative efforts toward two-way investment, trade and workforce development. Opportunities exist in the areas of advanced manufacturing, defense, automotive, energy, agriculture technology, information technology, cybersecurity as well as educational areas. Slovakia has been cooperating with the Indiana National Guard since 1994 and there has been a mutual interest in deepening cooperation beyond the sphere of defense. Indiana University and Purdue University currently have connections to academic institutions in Slovakia. In addition to Governor Holcomb and Mr. Zlatos, the group from Indiana included U.S. 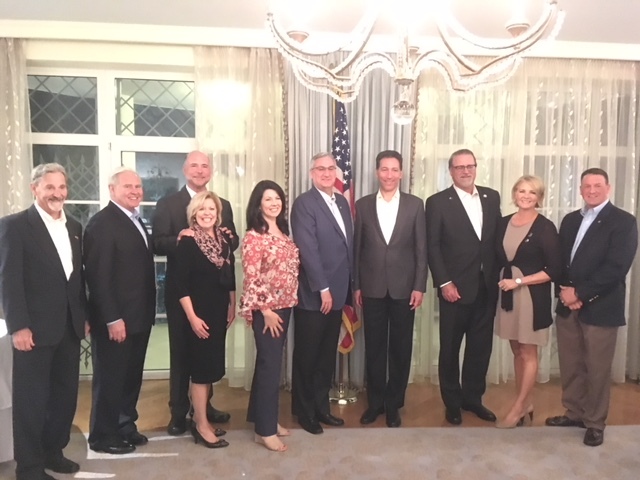 Ambassador to Slovakia Adam Sterling, Indiana House Speaker Brian Bosma and wife Cheryl, First Lady Janet Holcomb, Senate President Pro Tem David Long and wife Melissa, and General Courtney Carr, head of the Indiana National Guard. The team met in Bratislava with President of Slovakia, Andrej Kiska, and the Prime Minister, Peter Pellegrini. A large community of Slovaks lives in Indiana, while Indianapolis is home to the Slovak honorary consulate headed by Steve Zlatos. Read the entire Indiana Lawyer article here. Are you a bird lover? This one is for you! On Tuesday, Carmel-based Mr. Canary Co. released a revolutionary product on the Home Shopping Network (HSN). Mr. Canary has been selling their bird feeders through major retailers since 1995. Mr. Canary touts the invention as merely TV dinners for birds, which is a maintenance-free avenue to enjoy backyard birds. Basically, premium bird seed is sealed in single-use and eco-friendly trays, which slide into a permanent bird feeder. Bonus being: users don’t have to worry about hauling bird seed bags to the backyard and the cleanup is simple. The system ranges from $34.99 to $39.99. Sisters Jan Long and Chris Mowery bought the Mr. Canary brand in 1995. By 2013, Mr. Canary products were being sold in Kmart, WalMart and Kroger stores across the nation. Ace Hardware signed on in 2014, as well. Chuck Schmal of Woodard, Emhardt, Moriarty, Mc Nett & Henry LLP, along with Long worked together to secure a patent on the Bird Buffet System (US 9,686,968).